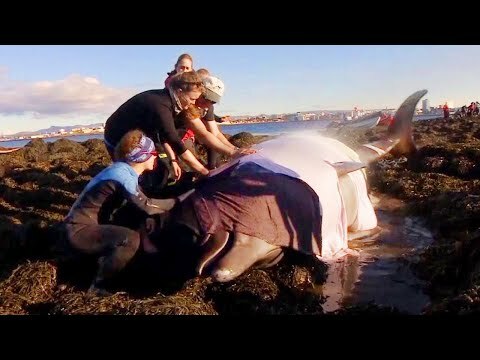 Rescuers in Iceland worked frantically to save two beached bottlenose whales. They sprayed water on the whales to keep them wet and used blankets and towels to help the marine mammals maintain their body temperature. The rescue effort happened on Engey Island, in the Reykjavik Bay area. Bottlenose whales can weigh as much as 7 tons. They are an endangered species, and it is illegal to hunt them commercially.